These actually make a great Autumn Craft for Kids, however you can of course make them at any time of year. As we have been getting some hotter days this year, we have made a few trips to the park recently. Whilst there, we played ball, look at the stream and collected some leaves. Now, I know autumn is the absolute best time for collecting leaves, but as Red Ted was keen, I thought, why not!? I did horrify me to realise that when it comes to leaves, I am clueless. I will have to brush up! Time for some more fun with Toilet Paper Roll Crafts for kids! These fun Bird Marionettes were first published in Autumn 2010 and republished for your convenience! 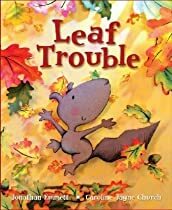 Leaf Trouble, Jonathan Emmett. This book tells the story of a little squirrel called Pip (perfect for our Pip Squeak!). Pip wakes one day to find that things are different: the leaves are changing colour and falling off the tree. Surely this isn’t right?! What is happening. His mum comes and explains why it is happening and that the leaves will come back again – a little like how the sun sets and comes back again the next day. I love the ending, where Pip compares the beautiful autumn colours to the setting sun. Very pretty. We have the leaves. But leaves can become brittle with time. I decided we should try leave rubbing – to discover that Red Ted is still too small. So I changed it to leaf printing and painting! He loved it! And had great joy doing it all by himself. Choosing colours. Painting and printing. I also found that your preserve the leaf a little if you paint it with acryclic paints. But in a way that seems a shame – you want to look at the lovely colours, no? Whilst at it, he painted some loo rolls too. Hope you liked our Autumn Leaf Birds! Adorable!!! Looks like a lot of fun! Thank you! We did have fun and I think Red Ted was very proud of his bird! Wow looks like you had lots of fun. I always dread painting and crafts but its never as bad as I think its going to be once I get started! And the kids always love it – I’m feeling inspired perhaps a little arts and crafts in the morning!! It’s so much fun to paint on a different surface. My kids love it too. The birds turned out really cute. Thanks for sharing this book and project! Oh wow these look amazing I am so impressed!! I will have to look for this book to it looks really cute, I will add it to our list for the fall. Love the birds, very cute. You are just so stinkin crafty! Where do you get all of these cool ideas? I feel like I am getting an F as a mother. Seems like I never get the time at home do do these fun things with my tyke. Awesome! Just so stinkin awesome! Thanks for linkin to It’s Stinkin’ Cute Craft Thursday as always! Those are just excellent – I love them! And, it looks like Red Ted had a ball. I love the marionettes. They look great. what a great project! I love how they came out…so fun!!! I love the puppets and the leaf rubbings. These are wonderful! Absolutely adorable! Love the trimmed rolls to form the bird beak – so smart! Thanks for linking up to Little Sprout Books: Feed Me Books Friday is HERE! How cute!!! that is a great idea! What a resourceful person you are, adjusting the craft to suit his skills. The results speak for themselves. He is a lucky little guy, you feed his mind and his creativity so well. Thanks for linking up to Finished for Friday! I love the project! I’ll have to think of a way we might do this. Ohhh…I love the marionettes! What a great art/craft project to do with the little ones! Your post took me back to when my three daughters were small and still at home…we were always crafting! Thanks for sharing your post with us today for Sunday Favorites…it’s sooo nice to have you join in with the fun!!! Really cute! my kiddos would love to make these, glad I found your site we will be homeschooling in the fall and will be checking back to steal some of your ideas! Those are adorable!!!! So creative! Thank you! Do have a go too!! Thank YOU for hosting such a fab link up! I love how you reused the paper tubes and they puppets turned out beautifully!! Thank you ! Glad you like them! Do Get Crafty too!! I am adding the book and the craft to the list of things to try in the fall – very pretty! Thanks for linking this up as well! Aaahhh, thank you for your kind words!!! And thanks for hosting the link up!! Sorry it’s taken me so long to read this, have had the page open for days, but a sick little girl has seen me a little bit busy in RL. What a neat way to bring in Autumn. I love the crafty birds you both made. Thanks for the great leaf ideas. I know my little one will want to paint one for sure. Have a great day. Thanks for the second link up..
Oh these a brilliant, am really looking at TRH craft atm. Have pinned. I love your marionette birds. They are so cute. I look forward to making these with the little ones in my life. I will do it with my boys, thank you so much!!! Where did you find this cute yellow apron with the red apples?